Marduk (Sumerian for "solar calf"; Biblical Merodach) was the name of a late generation god from ancient Mesopotamia and patron deity of the city of Babylon. When Babylon became the political center of the Euphrates valley in the time of Hammurabi (eighteenth century B.C.E. ), Marduk rose to the head of the Babylonian pantheon, a position he fully acquired by the second half of the second millennium B.C.E. He was also referred simply as “Bel," meaning “Lord,” or Bel-Marduk. Marduk was thus the chief deity of the Babylonian Empire during the period of Jewish exile in Babylon (sixth-fifth centuries B.C.E.). It was Marduk whom Cyrus the Great of Persia credited with the inspiration to allow the Jews to return to Jerusalem and rebuild the Temple of Yahweh. Marduk's association with the solar system's largest planet led indirectly to its being named Jupiter, after the Roman god who occupied Marduk's place in the pantheon. Marduk literally means "bull calf of the sun," although he was also a deity of fertility and storms. He was one of the sons of Ea (called Enki in the Sumerian myths), the creator/craftsman deity. Sometimes portrayed as double-headed, he was later given the title Bel, or "Lord," and was referred to simply as "Bel" in a manner similar to that of the Canaanite Baal (master/lord) and the Israelite Yahweh (the Lord). After the rise of the city of Babylon, Marduk became identified with the older chief Sumerian deity, Enlil, and has as many as fifty titles in all. In the Babylonian creation myth Enûma Eliš, Marduk was appointed as the champion of the gods and slew the tyrannical primordial sea-serpent goddess Tiamat together with her own champion, Kingu. Marduk then claimed the Kingu's prized Tablets of Destiny and fashioned a new cosmic order that included humankind, out of Tiamat's body. In this story it is also Marduk who initiated the astrological system and created the signs of the Zodiac. In Babylonian astrology, Marduk was connected to the planet known to us as Jupiter. As the ruler of the late Babylonian pantheon, he was later equated with the Greek god Zeus (the Greek equivalent for Jupiter). Thus, the planet was eventually given the name for Roman deity who occupied Marduk's position. 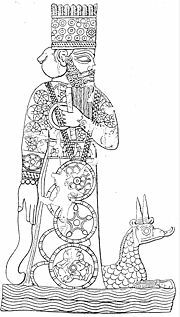 Marduk remained an important deity from at least the time of Hammurabi until well into the Persian period around 400 B.C.E. When Babylon became the capital of Mesopotamia, the patron deity of Babylon was elevated to the level of supreme god. Some scholars believe the Enûma Eliš, probably written around the turn of the first millennium B.C.E., was created to explain how Marduk came to a position of supreme power. The story became an important part of Babylonian culture and was re-enacted annually in lavish new year festivities. "O Marduk, thou art our avenger! The Bible refers to an act of Cyrus the Great of Persia—allowing the Jews to return to Jerusalem to rebuild [[Temple of Jerusalem|Yahweh's Temple]—that Cyrus himself believed was inspired by Marduk. After his capture of Babylon, Cyrus reversed the policy of his predecessors, who had captured the priests and destroyed the temples of the people they had conquered. He proclaimed the restoration of the indigenous religious cults in the countries he now controlled and provided funds for the rebuilding of temples to local deities. Marduk, the great Lord, established as his fate for me a magnanimous heart of one who loves Babylon, and I daily attended to his worship... I returned the images of the gods, who had resided there [in Babylon], to their places; and I let them dwell in eternal abodes. I gathered all their inhabitants and returned to them their dwellings... at the command of Marduk. Some Biblical scholars see a connection between Marduk's slaying of Tiamat and the biblical account of Yahweh's conquering the primordial sea-monster Leviathan. A cigar (tower) devoted to Marduk is thought by some scholars to be the origin of the biblical story of the Tower of Babel. and her idols filled with terror. The word "Merodach," which is found as a surname of several non-Israelite kings in the Bible, is a Hebrew version of Marduk. 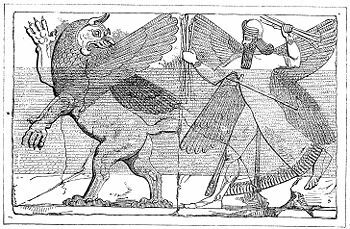 The name of the biblical character Mordecai, portrayed in the Bible as the uncle of the Queen Esther of Persia and later prime minister under King Xerxes, is also a derivation of Marduk. The deity referred to as Bel in Isaiah 46:1, Jeremiah 50: 2, and Jeremiah 51:44, is also probably Marduk. Finally, the apocryphal story "Bel and the Dragon," appended to the Book of Daniel in some Christian Bibles, describes how the prophet Daniel exposes a fraud by the priests of Bel-Marduk who pretend that an idol consumes large quantities of food which they are actually using to enrich themselves and their families. ↑ Leonard William King (trans. ), 1902, The Seven Tablets of Creation: The Fourth Tablet Sacred-Texts.com. Retrieved July 19, 2007. ↑ Jona Lendering, 2006, The Cyrus Cylinder: Cylinder 2, Livius.Org. Retrieved July 19, 2007. ↑ Ziggurat of Marduk (Tower of Babel) University of Haifa, The Library. Retrieved July 19, 2007. King, Leonard William (trans.). 1902. Enuma Elish. Sacred-Texts.com. Retrieved July 19, 2007. This page was last modified on 17 September 2014, at 16:10.